Now that we're looking for a house (a whole house! 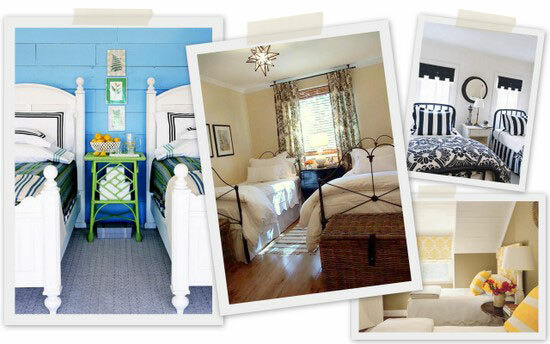 ), I am finding myself really preoccupied with thoughts of a guest room. I don't know why it's so fascinating to me...maybe because our condo was so not conducive to having more than three or four people there at a time. The other word that always peaks my interest is "storage." I know the realtors down here think we're nuts when they mention an attic, and Brad and I bound up the stairs shouting, "Storage? Storage! Look at those exposed beams! We won't have to keep your golf clubs in the trunk anymore!" But anyway, the guest room. I keep coming back to thoughts of twin beds sharing a room, which seems slightly 1962 but also sort of practical. It could expand the room to be shared by two people who wouldn't normally care to share a bed (say, when my Aunt and cousin come to stay). But really I think the appeal lies in the symmetry of it all...oh the symmetry. 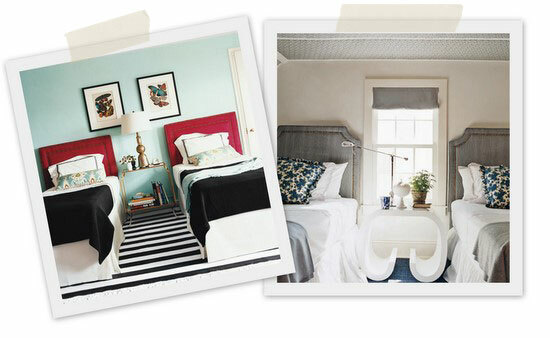 The idea of matching headboards with a table in between makes me endlessly happy! I love being in a guest room with twin beds as well. I get really excited to have my own bed. Newlywed phase must be over! I think two twin beds is GREAT! 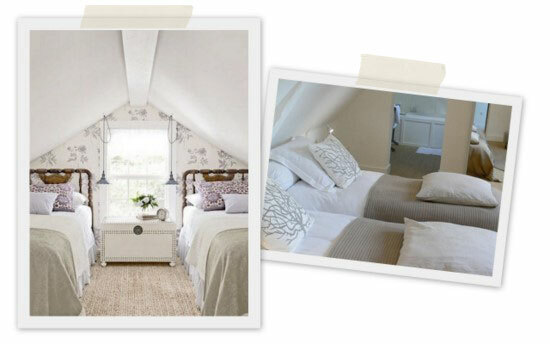 Much more practical for a guestroom!